One of the more heartening signs of life outside of the relatively unscathed portions of New Orleans was the re-opening of the legendary Saturn Bar. Sadly, O'Neil Broyard, the proprietor, died of heart failure in December, but his great-nephew, Neil Broyard, has re-opened the place. They will be marking the first anniversary of the storm in their inimitable style Tuesday night. I know nothing of this Egg Yolk Jubilee, but the fact that there is room for a live band suggests that Neil might have cleared out the back room, in which case you should tip him especially well. 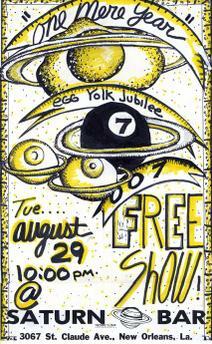 I have an Egg Yolk CD. Their version of "Brazil" is positively stupendous. It don't get much funkier than the EYJ. They have a fantastic tubaier. (That's french for Tuba playah). We will be headed there after the anniversary show on WWOZ-FM www.wwoz.org 10 PM CST which will consist of stalwarts like Bob Dylan, Steely Dan, Chris Whitley, Little Milton, Charlie Patton, Sister Rosetta Tharpe, Memphis Minnie, Gatemouth Brown, John Boutte, R.L. Burnside and others. A report will be forth coming. Egg Yolk is an excellent brass oriented band that does great versions of Brasil, Crazy Train, and an entirely original tune about romance gone wrong called BogalUSA. Opening will be 007, the rock steady krewe with Jonathan from the Klezmer/Naked on the Floor, Alex from Tin Men/Royal Fingerbowl, Joe from the Iguanas, and Jeffrey from G. Love. apparently the place is cleaned up and ready to roll. Went to the Saturn Bar last night. It was great. Less dusty and less grandma's attic, but still whimsical. You can see all sorts of pictures and painting and wall hangings that were once obscured by grime. The back room is cleared out so now bands can play there. As someone said, "I miss the pool table, but I'm glad the 6 washing machines are gone." O'Neil Broyard is hopefully resting peacefully.